Being a huge fan of all things chocolate, I was itching to try out this Amazon Cake recipe that a few food bloggers have tried. Debbie of Words To Eat By attempted this cake and got only good words to say. Barbara of Winosandfoodies also tried her hand at this recipe and was pleased with it. So I thought that it was a done deal and promptly saved the recipe in my laptop. Today, my cousin Krystle was at my place hanging out and we got pretty bored. I suggested we do something fun…. like, erm baking! haha. yea it’s the most fun thing to do on a rainy day. But what was I to bake? We didn’t want to do something that required lots of time. Then I remembered this Amazon Cake so I told her about it and she was game enough. Both of us then trotted to the kitchen happily to mix all the ingredients together. This is one of the most simple recipe I’ve ever attempted and it seemed rather healthy too. There are no eggs and butter required! Imagine that… hmph. Was a bit sceptical at first but then, what the heck, I have nothing to lose, just lots of free time so why not! And we mixed the dry ingredients and the wet liquids and combined it to form a thick batter and in it went into the oven. About half an hour later, it came out smelling really good. Still sceptical, I slowly cut a slice and sprinkled some icing sugar as instructed and took a bite. Then there was a pause. A very pregnant pause. Good or bad I really don’t know. Maybe it’s because I’m a chocolate lover and usually prefer really chocolatey cakes. I wasn’t blown away by this Amazon Cake. It was decent, it was not too bad.. I like the moist feel but not fantastic. Maybe I didn’t add enough sugar or added too much flour. Either way, it wasn’t the best chocolate cake I’ve eaten. It wasn’t like a disaster or anything. Just doesn’t give that ‘oomph’ ya know? Whatever it is, I think I will have to try this out again… and see if it could be better than this first attempt. However, please don’t let this deter you from trying it out yourself. I think it’s an interesting cake! There’s cider vinegar required as well. Have never baked a cake with cider vinegar. I think I prefer my brownies over this cake. Heat the oven to 350 Fahrenheit/ 180 degrees celcius. Whisk together the flour, cocoa, baking soda, sugar and salt. In a separate bowl, whisk together the oil, vanilla and vinegar with 1 cup cold water. Whisk in the dry ingredients, blending until completely lump-free. Pour into a greased 9-inch round cake pan. Bake for 30 to 35 minutes, or until the top springs back when pressed gently. Cool before removing from the pan and dusting with confectioners’ sugar, or frosting if desired. i tried this exact same recipe before! 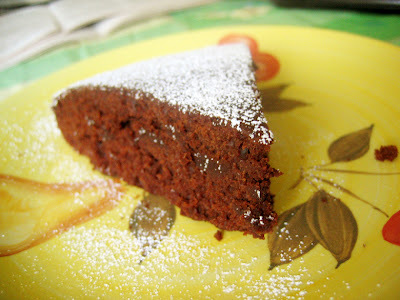 but the name wasn’t as impressive as AMAZON cake, haha it was called the eggless chocolate cake. my cousin had a slight allergy to eggs, so when they came round for dinner, i wanted to make a dessert that he could also have. but it turned out dense and very flour-y, so i threw it out thinking no way was i gonna serve that. i guess eggs are really an all-important leavener. sorry, what is confectioner’s sugar? is it castor sugar?